Couches. Carpeting. Candles. In the beginning, that's what I used to tell people as a brief synopsis of what to expect upon entering the aptly named Shadow Lounge. 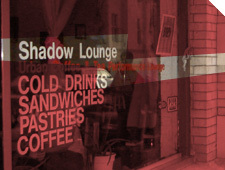 Today, the Shadow Lounge has developed into much more - from French-pressed coffee and espresso to ginger beer, from Fantasia smoothies to oatmeal cookies the size of your head - Justin Strong is turning his "urban coffee /tea performance lounge and gallery" into a multi-faceted enterprise that appeals to far more than your taste-buds. If you're a fan of performance art in the form of live music and poetry, or if you want to check out the latest issue of "Fader" while listening to Common, even if you're looking for a laid-back spot to grab a Vitamin Water and finish your English paper, the Shadow Lounge is the perfect setting. When it first opened in 2000, the Shadow Lounge looked like your hip cousin's basement. Strategically placed cozy chairs, coffee tables strewn with magazines capturing urban culture, chess and a few other board games (anyone else miss the pool table?) and a well-placed stage/performance area. Justin wanted to offer Pittsburgh's happening, party-hopping hipsters a refuge from the (cigarette) smoke and (funhouse) mirror environment of most bars and nightclubs. The Shadow Lounge opened its doors late-night on weekends - one could stumble in and mingle, or simply flop on a sofa and cool down to the sounds of jazz, hip-hop, or rhythm & blues. Justin also began booking local acts such as the Akil Esoon Quintet (now more or less "Beam"), Soma Mestizo, the Pittsburgh Poetry Slam, DJ Centauri, and a few out-of-town performers like Dap Theory, Ray Keith, MKL, Moonstarr and Daniel Wang. He also held local art openings, and began regularly displaying artist's creations on his walls as a perfect compliment to the Lounge's growing ambiance. In just its second year, the Shadow Lounge already boasts being a venue for Element 5's "Momentum" and Ground Zero's "Flux" events, as well as regular installments of the "Hip-Hop cafe" (Weds., weekly), "Versus" (Fri., weekly), "Jazz Satellite" (Sun. weekly), "the Andy Bianco Trio" (Mon. weekly) and the Pittsburgh Poetry Slam (3rd Tues, monthly). Justin's also been included in "Pittsburgh" Magazine's "40 Under 40" and he and the Shadow Lounge have been featured in the Pittsburgh City Paper. If you're wondering why the words "Shadow Lounge" are popping up more frequently in everything you read about local events, there's a good reason. A place where you can feel hip without the pretentiousness, much of the Shadow Lounge's original "cozy" vibe remains. With the addition of the café, this "performance lounge" provides the perfect spot for soaking in Pittsburgh's creative scene, while allowing you to feel at home in doing so - which is just what Justin has hoped to accomplish. Doors are now open at 8a.m. on weekdays, and he's recently made the lounge BYOB (for a $2 corking fee). The Lounge is also available for private booking on Saturdays, call for more info. If you're one of the many who have "heard of it, just haven't gotten a chance to stop by" - you're definitely missing out. In two short years, the Shadow Lounge has become synonymous with Pittsburgh's urban artistic scene. So stop by - Justin's often behind the counter (or behind the mic). Say hello - and make yourself at home.